This year, the “winter solstice” in Japan fell on this Dec.21st. It has been customary to eat winter squash and take a ” yuzu- yu”(ゆず湯) bath in Japan. 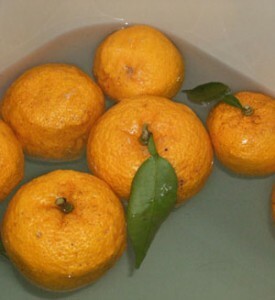 Yuzu is a type of citrus fruit, and we put some yuzu in our bath so that the hot water can get sweet scent of yuzu, which is believed to be good for health. The two customs are said to have started in Edo period (1603-1868).The reasons are not so clear, but as for taking “yuzu-yu” bath , it is said the custom started because of a pun, for “冬 至”(touji/winter solstice ) and “湯治” (touji/hot spring cure)” have the same pronunciation of “touji”. 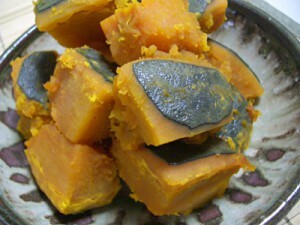 As for the other custom of eating squash, it is said; The Japanese word for a squash “kabocha” is written as “南瓜” which could be also pronounced “nankin” , and it was widely believed a fruit or vegetable that ends with “n” sound in its name had a special effect to invite “運”(good fortune) which is pronounced “un”. Actually squash contains nutritions to keep people from catching a cold and other diseases especially brain ailments. By the way “南瓜” ‘s “南”　means “south” and “瓜”　means ” gourd”, and “西瓜” which means a watermelon, implies a “west gourd”. Therefore yesterday,On 21st, I eat boiled winter squash, which was very sweet, assorted with sweet beans, all of which were very delicious. My mother is a good cook ! After I enjoyed my dinner of squash, I took a “yuzu-yu”bath, which I also enjoyed very much and I was able to be relaxed in the comfortable hot water on such a cold winter day whose length of the daytime was the shortest in the year.